There is nothing more dangerous than a mother protecting her young. We have recently learned that somehow, on an isolated island in the Pacific Ocean, there is a female velociraptor living with five offspring. As a paleontologist and adventurer—as a man of science—your mission is to capture the baby raptors alive, or at least neutralize their fast, powerful, and protective mother by tranquilizing her. This is chance of a lifetime—to become one of the few humans who have seen a living dinosaur. It also means engaging in a ferocious struggle with one of the most vicious predators who ever walked the earth. Raptor is a two-player board game of strategic movement and careful planning, designed by Bruno Cathala and Bruno Faidutti. One player takes control of a family of velociraptors; the other controls a team of brave, determined scientists. The raptors win if three of the babies escape capture or if they eradicate the scientists. If the scientists manage to neutralize the mother or capture three baby raptors, they win. Each side has its own unique actions and abilities in this quick, easy-to-learn, card-driven game where both players are simultaneously predator and prey. The game begins with the mother raptor occupying the middle of the board, her babies spread out in the surrounding area, and four scientists encroaching upon them from either side. You and your opponent both shuffle your cards and draw a hand of three. From that hand, you select one card to play and place it face down. Both players reveal their cards simultaneously. If both players’ cards have the same numerical value, the cards are discarded, you refill your hand, and a new round begins. If you played the card with the lower number, you go first and perform the action indicated on the card. If your card had the higher number, however, you don’t perform your card’s action. Instead, you get a number of action points equal to the difference between the cards: if you played a card with a six and your opponent played a card showing a four, you then have two action points to spend however you want. Moving a scientist one space on the board costs an action point, as does capturing a raptor, attacking a scientist, or putting out a fire. In every round, you must choose between the powerful actions offered by your cards and what you might accomplish with a few action points instead. You can play low-valued cards when you need to perform the action on the card far more than you need any action points. When you want action points more than anything, play the highest-valued cards. The raptors have two goals in a game of Raptor: to get the baby raptors to safety by moving them off of the game board and to kill the scientists who are threatening your safety. As the player controlling the raptors, you have five actions to spend your action points on. With one point, a baby raptor can move into an adjacent space and its mother can put out a fire, kill a scientist, or wake up a baby raptor that is sleeping. One point also enables the mother to go as far as you want in a straight line, as long as she doesn’t run into an obstacle. If she’s wounded by the scientist’s tranquilizer darts, however, you must spend action points equal to the number of wounds before she can move. 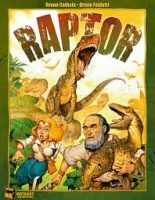 Add a Review for "Raptor"